Margot Schulzke's name will probably be familiar to anyone who has read The Pastel Journal, as she has written a regular column for the magazine for some years. 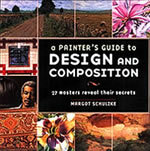 Her clear and easily understandable writing style is now showcased in her new book, A Painter's Guide to Design and Composition (North Light Books, 2006). Schulzke begins with the basics of design, explaining that Every successful painting begins and ends with a solid design. A good composition elevates a work of art from amateurish and ordinary to stunning and extraordinary. She then explains and illustrates-with paintings in various mediums by a total of 26 artists represented in the book-the building blocks of good design, including space, shape, line, value, color, texture, pattern, intervals and proportion. In addition to images presented to explain particular concepts, there are a number of step-by-step progressions of paintings by various artists. At the end of the section is a summary of 21 Pointers for Better Composition, a list that would be well worth reading frequently, if not memorizing. In the second section of the book, Schulzke explores what takes a painting beyond good, what gives a painting that masterful touch that makes it unforgettable. She discusses establishing the mood of a painting, understanding planes and masses, and creating rhythm, as well as developing style. At 144 pages, and loaded with images, one might think this book would be a quick read, but that is hardly the case. There is so much valuable information presented in the text that it bears reading carefully, and reading repeatedly. Richard McKinley, another former PSNM national show judge and workshop instructor, says, I have collected art books for over 35 years, some dating back to the 1800's, and Margot's is one of the best I have seen. What a beautiful job. The book is available through major booksellers, including Barnes & Noble, Borders, and on-line at Amazon.com.